Volume Analysis and Market Profile are two very powerful tools that will help traders succeed in finding trading opportunities. In a recent webinar, Andrew Pawielski explained how traders can use these two tools to see clear patterns, find imbalances, look for momentum, associate prices with volume and more. Here’s why you should be using volume analysis and market profile. As Andrew explains at the beginning of his webinar, every trader should have a good profiling tool. This tool will allow a trader to dig below the surface of the bid/offer, allowing a deep dive into how much relative volume has aggregated over a period of time at what specific price. When a trader has this information, they can then plot the data in such a way that it shows the relative frequency of volume at each price. This becomes the first step in predicting the probability of an outcome. 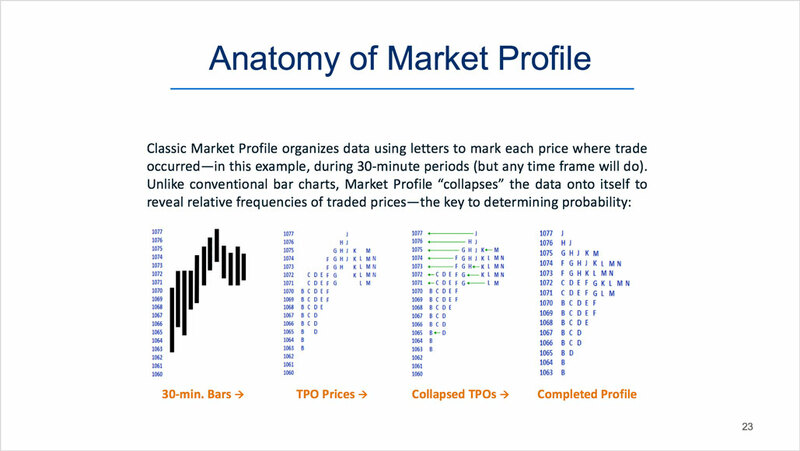 As the analysis progresses, Market Profile uses letters to indicate each price where a trade has occurred, and then “collapses” the data into frequencies so that it’s clear which price will happen most often. Being able to predict this number is a key element to leveraging the probable outcome of a trade. Throughout the rest of the segment, Andrew demonstrated the power of charting, as he added layer after layer to his profiling tool. In particular, he showed the specific information a trader can get from TAS boxes, navigator, VEGA bars, and magenta bars, which indicate exhaustion warning. His slides were full of detail of exactly what to look for as the markets go from balance to imbalance phases. As he continued into the heart of the webinar, Andrew focused on particular indicators in his tools. In slide after slide, he showed the audience examples of the nuances of the profiling tools, how to put together a strategy and multiple examples of what a profile chart can tell a trader. 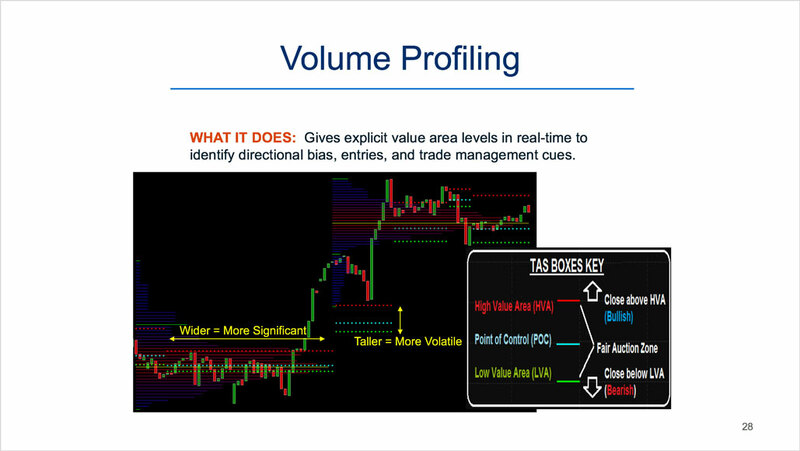 This webinar should be required material for any trader who wants to use volume and market profiles to effectively and intelligently manage trades. Perfect for both the novice and the expert alike, this webinar covers comprehensively how to understand these two elements. To get started, watch this on-demand webinar recording.